_________________________________________________________ Where the chic come to critique. “Learn to paint!” the box exclaims in bold, red letters, appealing to my creativity and competitive nature as I wander the arts and crafts aisle. Immediately I am on my back in the Sistine Chapel next to Michelangelo and unquestioningly placing the Dimensions Paintworks paint-by-number in my cart. A tiger pauses in the jungle to lap water on the box. Underneath are eight vials of paint, which seem insufficient for covering the board inside. Lighter colors require multiple layers and should be painted before darker ones for a cleaner finished product. Though paint-by-number has helped aspiring painters since the 1950s, this package gives little information about mixing paint in correct proportions and quantities. The package comes with one brush that requires frequent washing and drying. Over time the bristles separate, making detailed work impossible. One starts hunched over the canvas, trying to paint as accurately as possible. Whether out of frustration or learned skill, brush strokes become more fluid and the paint-by-number becomes a painting. Verdict- The gimmick is true: You will be no Michelangelo, but paint-by-numbers can teach you how to paint. 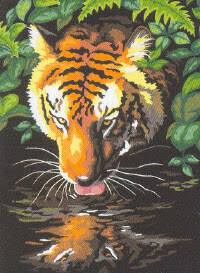 The Dimensions Paint Works Paint-By-Number “Tiger Reflection,” number 91257, retails for $4.97 at Walmart.